Oscilloscope update rate, or the amount of time the scope is acquiring and displaying a signal on screen, can be just as important as bandwidth, sample rate and memory depth as the rate determines how much signal data a scope will be able to display. As designs become more complex, a fast waveform update rate is even more critical to capture random and infrequent events. This is a core strength of the Keysight 3000T X-Series oscilloscopes, which offer the industry's fastest waveform update rate of 1,000,000 wfms/s. The 3000T X-Series provides the fastest waveform update rates and they are also the only scopes that can maintain these fast update rates when using the integrated logic channels, serial bus decoding, math functions or measurements. 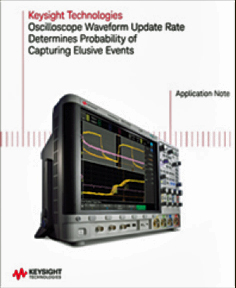 Take analysis to the next level with the Keysight's zone touch triggering, which allows users to instantly isolate any signal seen on screen—a fast update rate ensures that all of the signal detail can be seen and zone triggering provides a simple way to isolate an anomaly for further analysis. 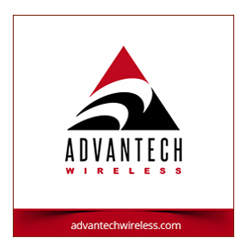 Additionally, Keysight Technologies, Inc. has extended their One-Stop Calibration Services to now include non-Keysight equipment, reinforcing the company’s commitment to support complete test systems. Keysight’s One-Stop Calibration Services ensure ongoing accuracy and availability of test assets, as well as electrical, physical, dimensional and optical equipment from virtually any manufacturer. This helps engineers develop, deploy and maintain test systems at a lower cost. Today’s test systems often integrate instruments of different form factors from multiple vendors. This includes an increasing number of PXI and AXIe instruments being used with traditional benchtop instruments. These instruments are frequently deployed in complex solutions that require onsite setup, maintenance and repair. Keysight’s One-Stop Calibration Services address the growing need for better multi-vendor system support and is now covering more than 100,000 products, including non-Keysight benchtop, PXI and AXIe instruments. Keysight also announced they have expanded their offering of high-performance PXI and AXIe instruments and reference solutions. The instruments and solutions are used in a wide range of applications, including 5G, PA/FEM and digital interconnect test, to increase test speed, improve accuracy and reduce the overall footprint. The new products are part of Keysight’s on-going commitment to deliver unrivaled RF, microwave and digital measurement expertise in the PXI and AXIe instrument form factors. Using the best available instruments—benchtop, modular or a combination—the reference solutions deliver proven hardware and software test configurations for critical applications, including 5G, EW threat simulations and digital interconnect test. The M9019A PXIe 18-slot Gen 3 chassis, controller, I/O components and external PC option provide the highest system bandwidth on the market. This new series of PXIe system components offer at least two times more system bandwidth than a typical Gen 2 chassis, and the external PC option removes the limitations on PC selection imposed by closed PXIe systems. With Keysight’s open Gen 3 platform, customers can select an external PC or controller that best meets their need. For example, a 5G or electronic warfare application requiring a PC optimized for the capture and playback of large data streams; or a MIMO application requiring a large, multi-channel and multi-chassis PXIe test systems. The 4-slot M9421A PXIe vector transceiver (VXT) and the M9111A PXIe high-speed source/measure unit (SMU) improve test throughput, reduce the overall footprint, and are built for production test and design validation of next-generation PA/FEMs. 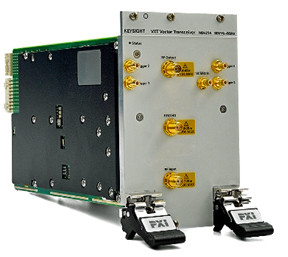 The new PXIe VXT and SMU will be the part of Keysight’s RF PA/FEM characterization and test reference solution. Covering frequencies from 60 MHz to 6 GHz, with modulation and analysis bandwidth up to 160 MHz, the VXT supports FPGA-accelerated measurements and includes software that supports analog demodulation, noise figure and a broad range of cellular and wireless connectivity formats. The SMU changes voltage, stabilizes and accurately measures micro-Amps, all in less than 1 ms. This is a 20 times speed improvement over previous-generation, stand-alone Keysight SMUs, and is a fraction of the size. The new Digital Interconnect Test reference solution is the world’s fastest cable tester and features the PXI VNA with full cross-bar s-parameter calibration of 32-ports up to 26.5 GHz. The PLTS software offers complete domain analysis with a convenient production test interface.